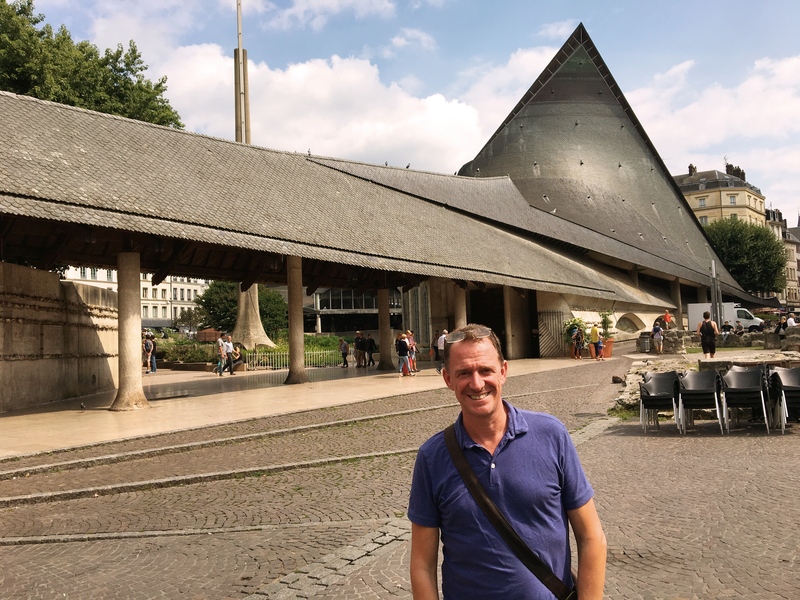 I’ve fallen way behind in keeping this up to date, as I spent much of the last week either visiting with friends – a good thing – or trying to track down my lost luggage after I arrived back in the States. Not such a good thing. 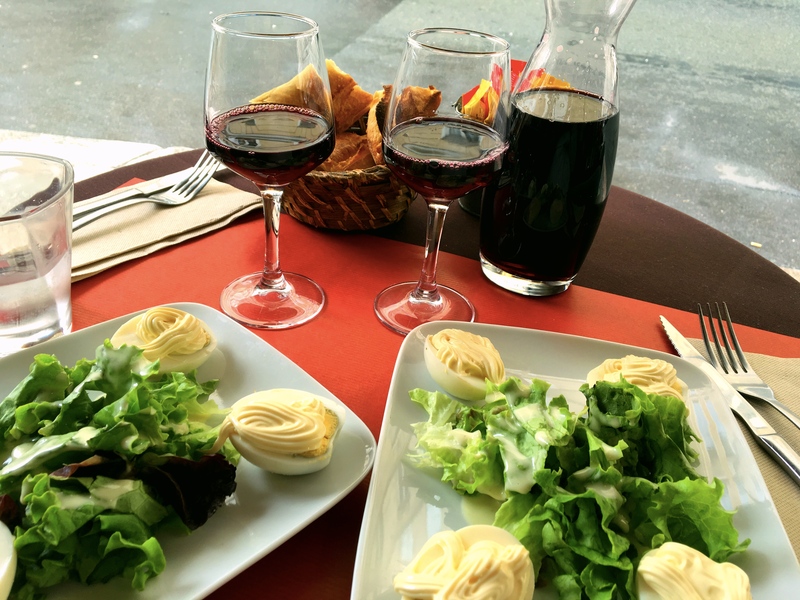 Before that fiasco, though, we spent five more days in Paris. And once again it was nearly perfect. Great weather, great food, great walking, great parks. 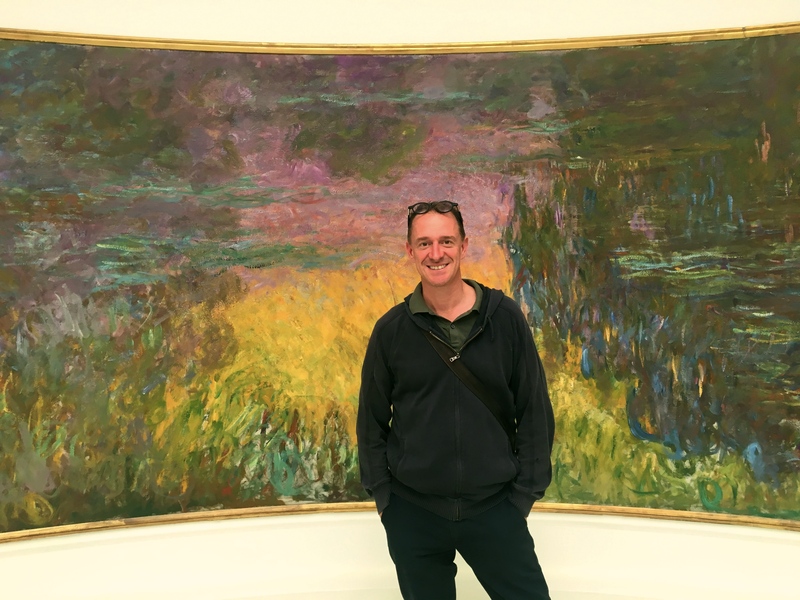 One highlight was what might have been my first ever visit to the Musée de l’Orangerie, an impressionist and post-impressionist museum in a corner of the Tuileries Garden. It was closed for renovations from early 2000 through 2006 and somehow I think we’d just never made it there. 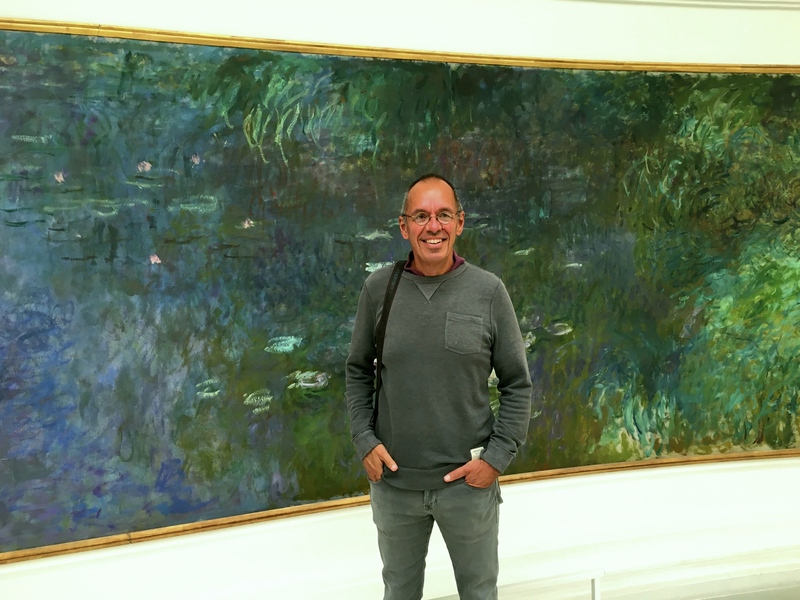 The star of the show there are Monet’s Nymphéas, eight large water lily canvasses in two separate oval rooms. Beautiful, and I appreciate an exhibit that only takes a few minutes to enjoy. 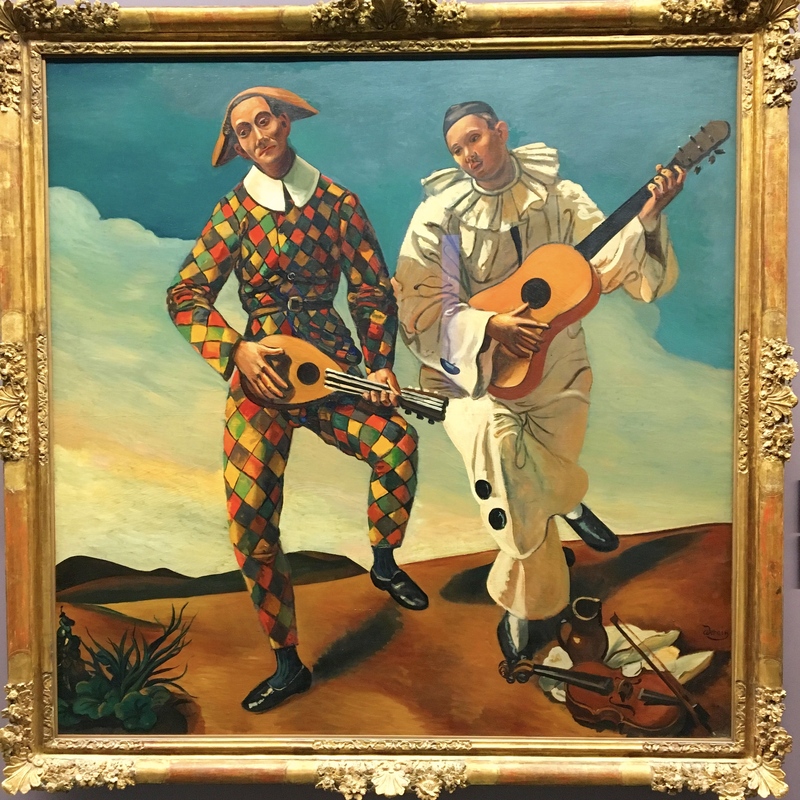 They were appropriately great, but I really enjoyed the exhibit one floor below made up of Guillaume Walter collection of early 20th century art. 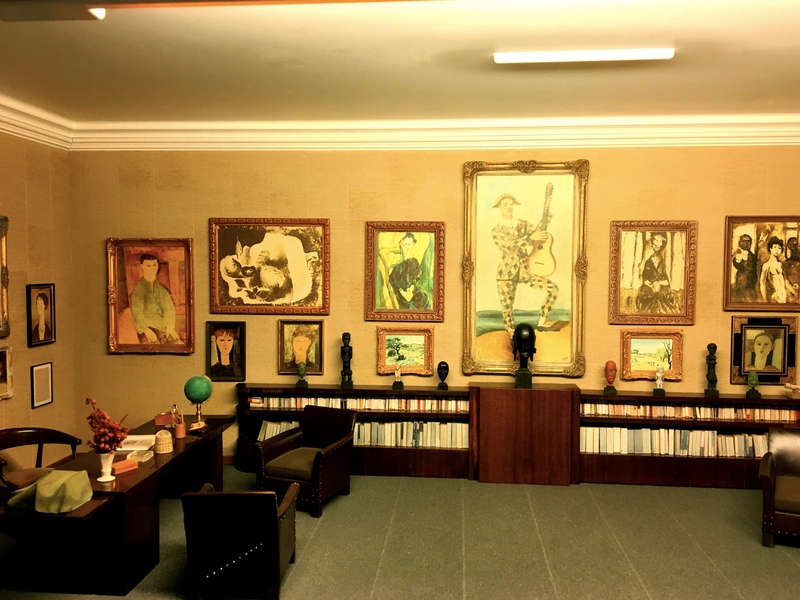 There’s a fun story about the Guillaume Walter collection. 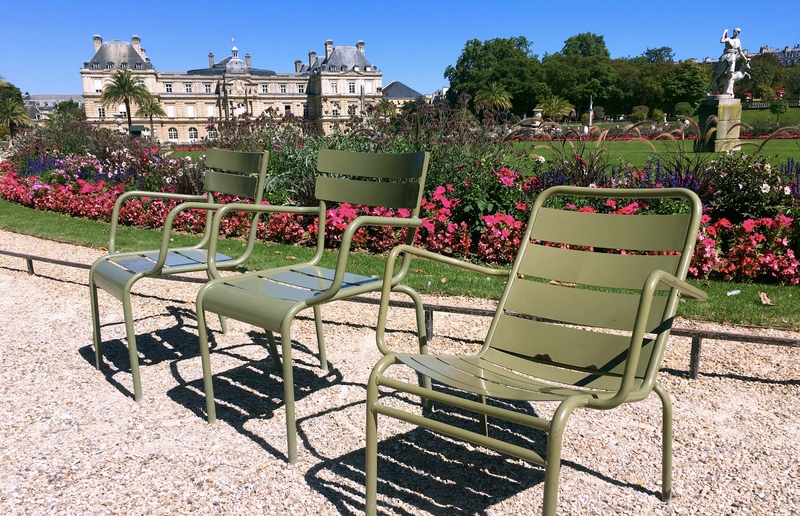 It’s named not for a Mr. Guillaume Walter, but rather for Paul Guillaume and Jean Walter. Guillaume was an art collector and, when he died, his widow Domenica married the wealthy Walter and continued to expand the collection. 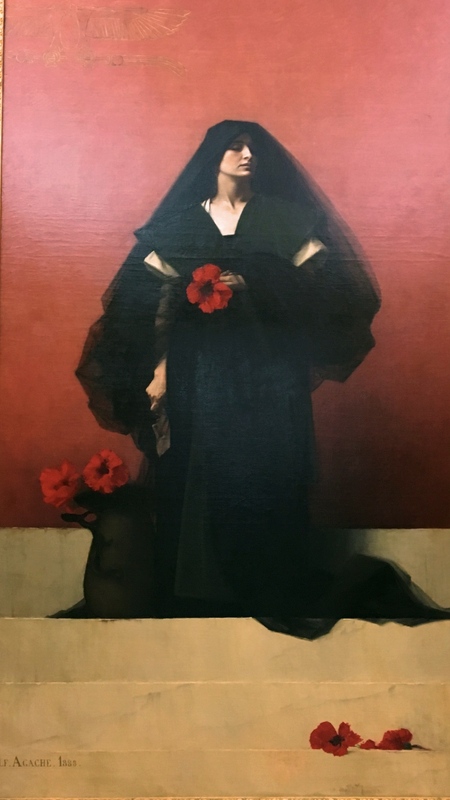 On her death, she donated the collection to the museum. What makes it really interesting, though, is that Paul Guillaume died early and under suspicious circumstances. Some thought Domenica may have been involved, but charges were never brought. Then she married Walter … and he died suspiciously after being hit by a car. Oh yeah, and her adopted son survived an attempted murder. Apparently she lived out her life as a widow but somehow notwithstanding her inherited wealth other men weren’t flocking to marry her. 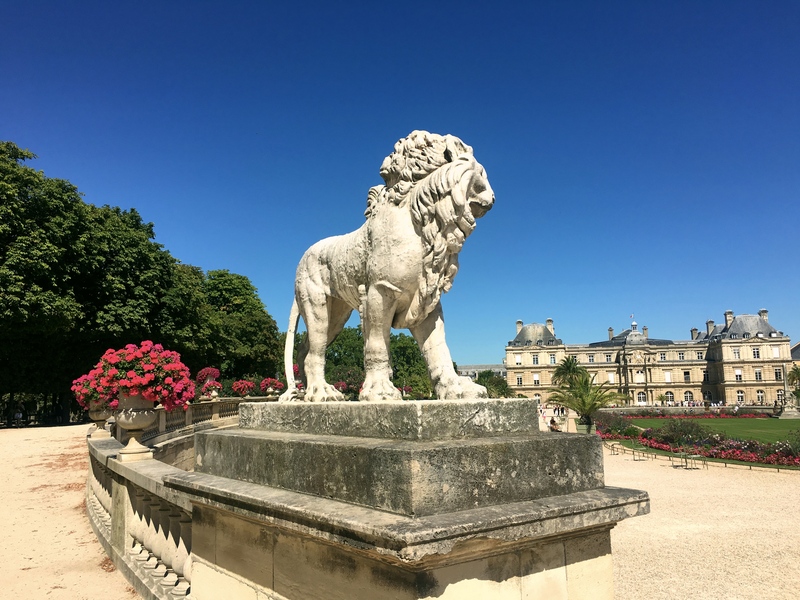 We love the Luxembourg Gardens. In late August it was surprisingly empty but still a glorious spot to sit and read. 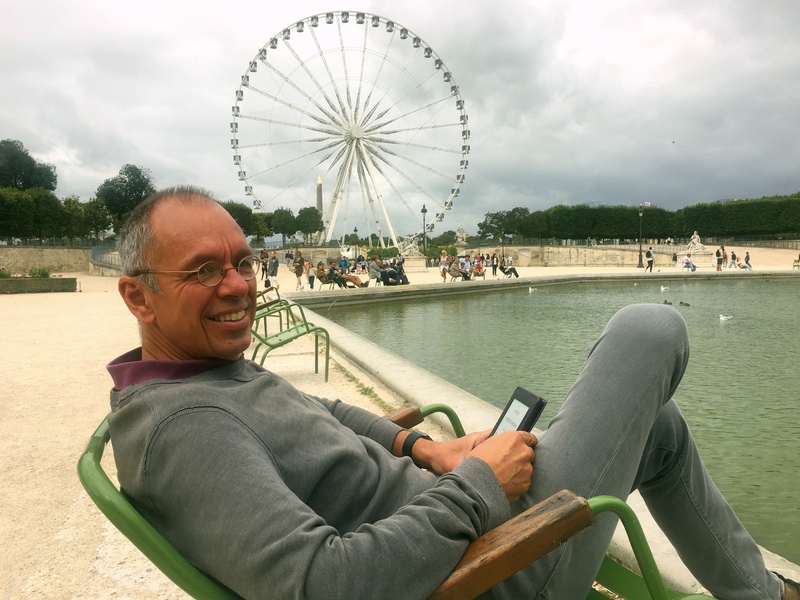 Otherwise it was a lot of walking, drinks one night before dinner at the newly renovated Ritz Hotel, and lazy afternoons in the parks. And starting to plan in more detail our fall jaunt through the South Pacific including, it seems, a couple weeks in Papua New Guinea. That’s all a few weeks off, though, as first from here it was back to the U.S. for a couple weeks visiting family. 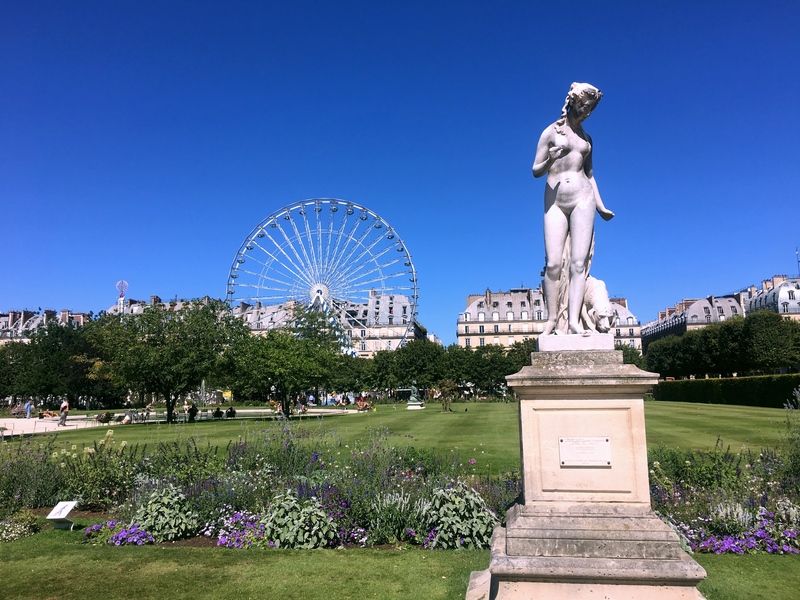 The Tuileries on a sunny day. I wouldn’t guess that the ferris wheel is permanent, though it was there in May and just looks great there. And then there was food. 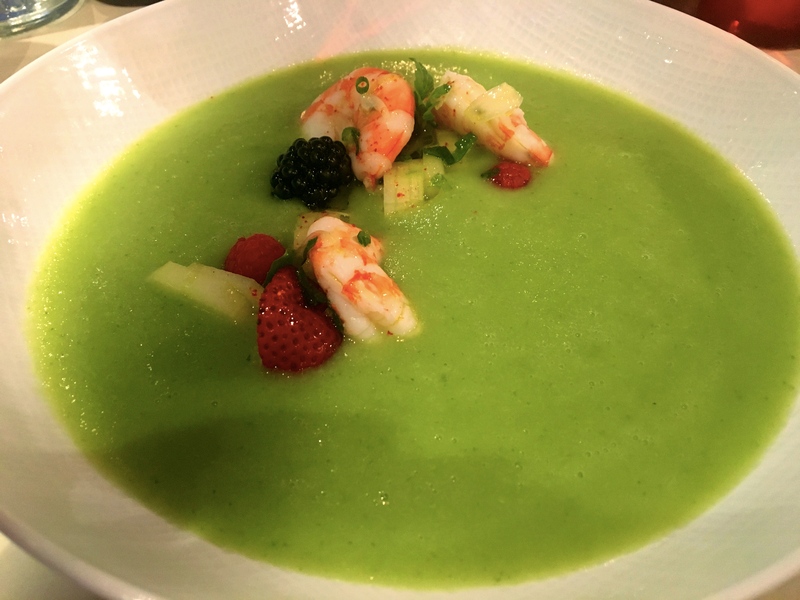 This was an amazing gazpacho in one of the 50,000 great restaurants in Paris. One of our favorite appetizers, available on most Bistro menus, is oeuf mayonnaise, simply hard boiled eggs and fresh, home-made mayonnaise. It is sublime (and the wine doesn’t hurt, either). 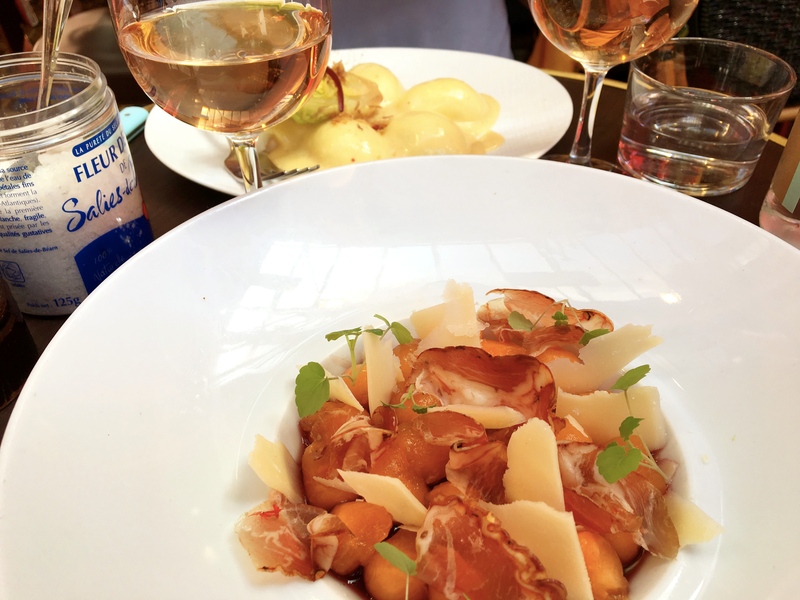 Chilled melon balls with prosciutto and parmesan all in a red wine sauce. 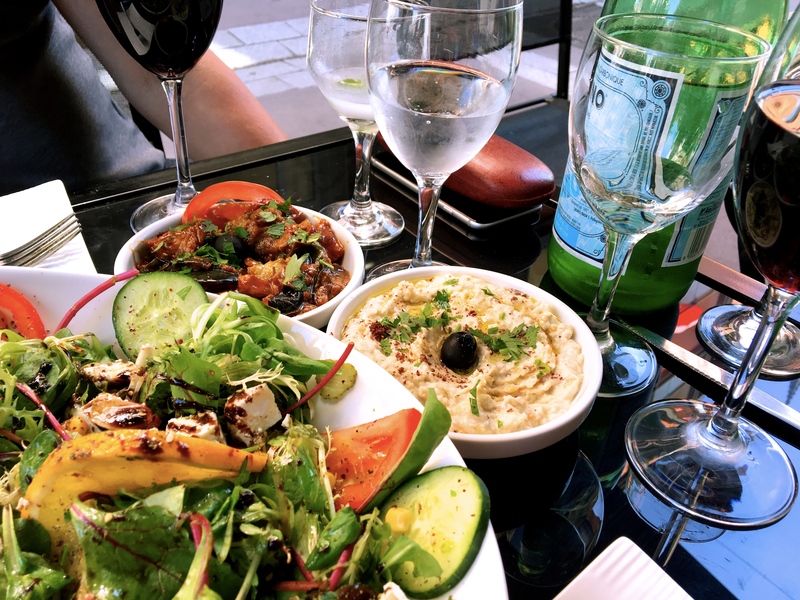 Just in case there was ever any doubt that the French know how to do food. And finally. We’re walking past this little store on a Sunday when everything was closed. 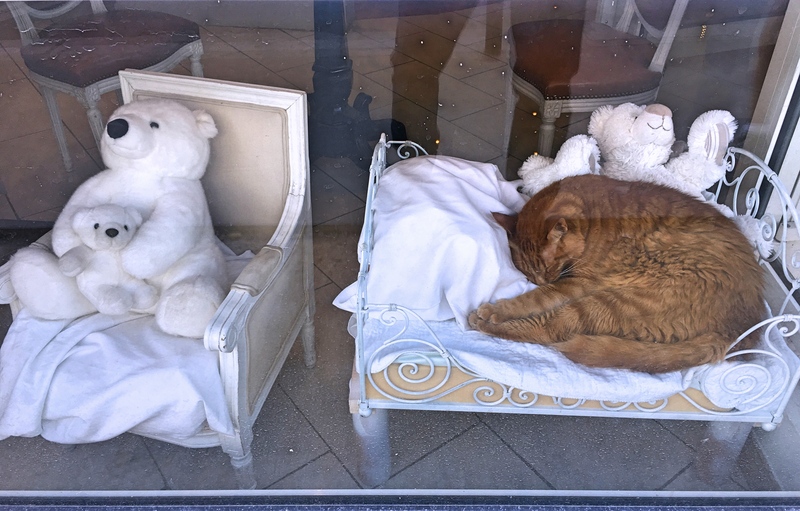 Teddy bears, sleeping cat, and you think we could NOT take a picture? 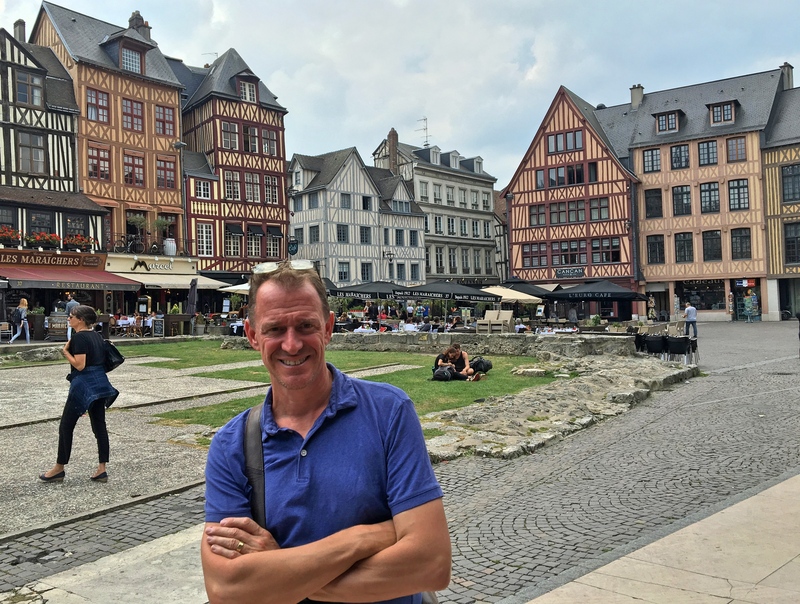 Our second stop in Normandy was, Rouen, a city of about 110,000 people on the Seine River and the birthplace of French President Francois Hollande. 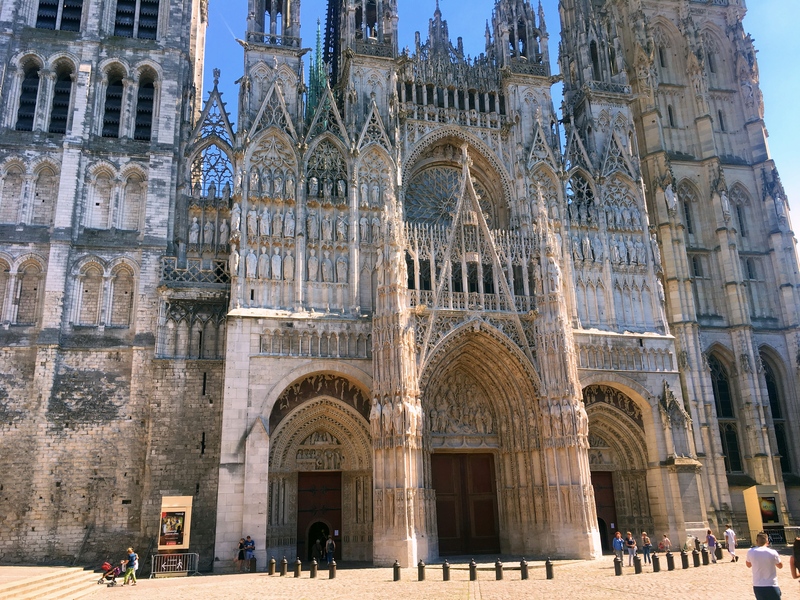 Rouen has been the capital of Normandy for many centuries, including during the Middle Ages when the various kings of England held Normandy as part of their inheritance from William the Conqueror. 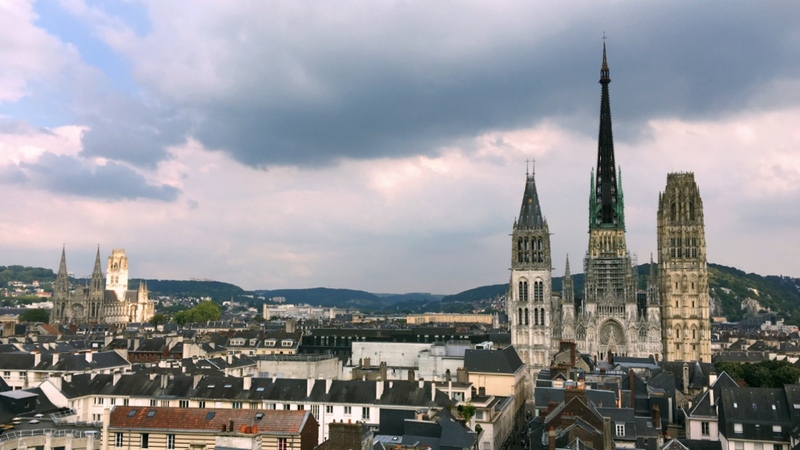 The main sight in Rouen is the Notre Dame Cathedral, a Gothic masterpiece started in the 12th century and made famous by a series of paintings by Claude Monet. Monet painted the same scene of the church facade in a variety of weather conditions and at various times of the day; as Mark said when we first saw it “It’s strange to see something for the first time that you’ve seen so many times before.” Beyond the stunning facade is the Butter Tower, a 250-foot tall spire that was allegedly financed by selling indulgences allowing people to eat butter during Lent. 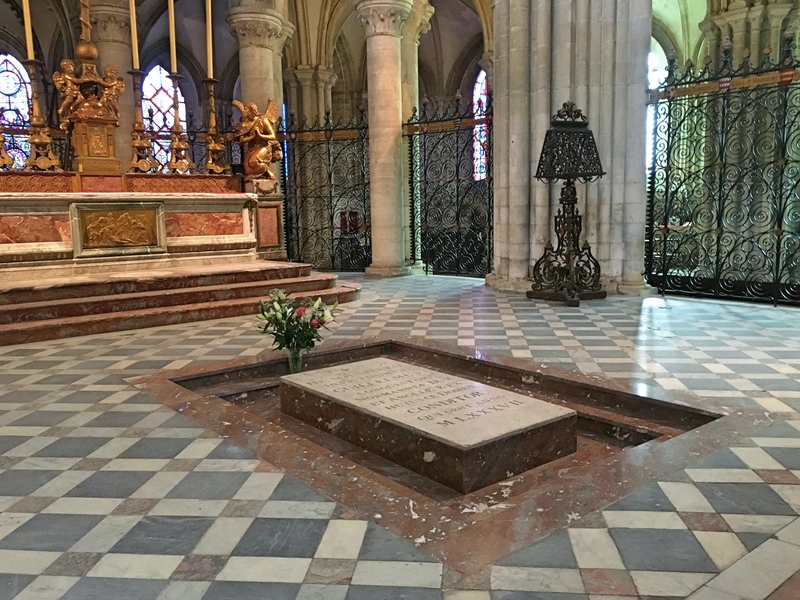 And inside the Cathedral you can find a tomb with the heart of Richard the Lionhearted, King of England who died in France trying to secure his Norman ancestors’ claim to Normandy. The rest of him was buried elsewhere but his lionesque heart was here. 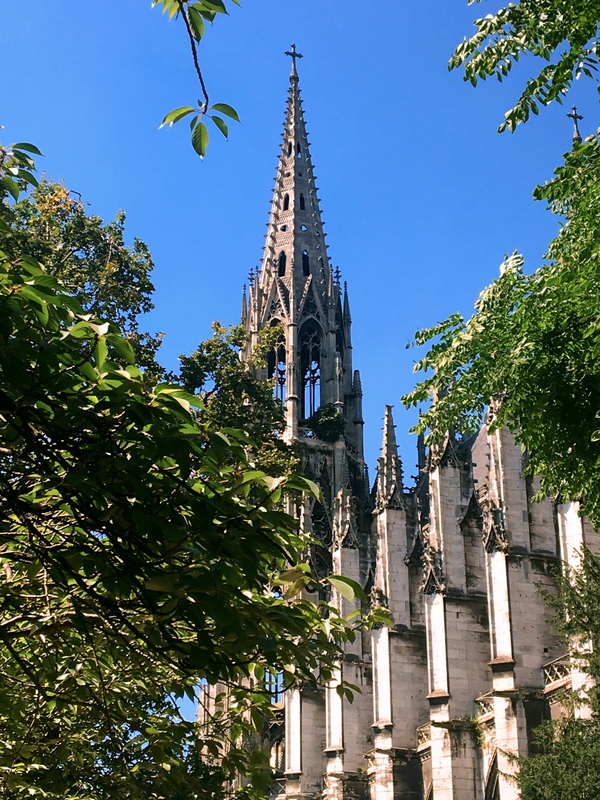 There were several striking churches in Rouen besides the Cathedral, though oddly they were mostly closed when we tried to go inside. 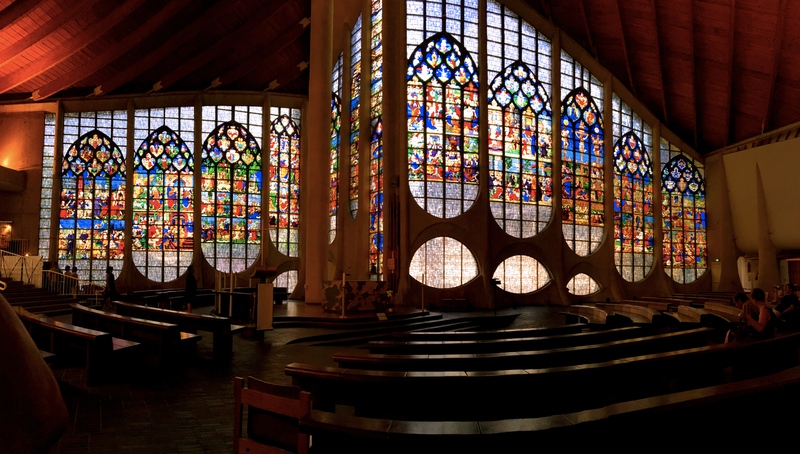 The one exception was the strange Church of St. Joan of Arc. It’s a 1970s building with the exterior sort of in the form of a fish and from the outside it’s pretty much as unattractive as that makes it sound. It’s in an historically important spot, though, on the very site where Joan herself was burned at the stake as a heretic by the occupying English in 1431. Notwithstanding the strange exterior, though, the interior is … OK.
That was it; a quick two-day stop in a beautiful Norman city, definitely a worthy substitute for our planned trip to Ireland. From here it’s back to Paris and then on to the U.S. for a little visit. 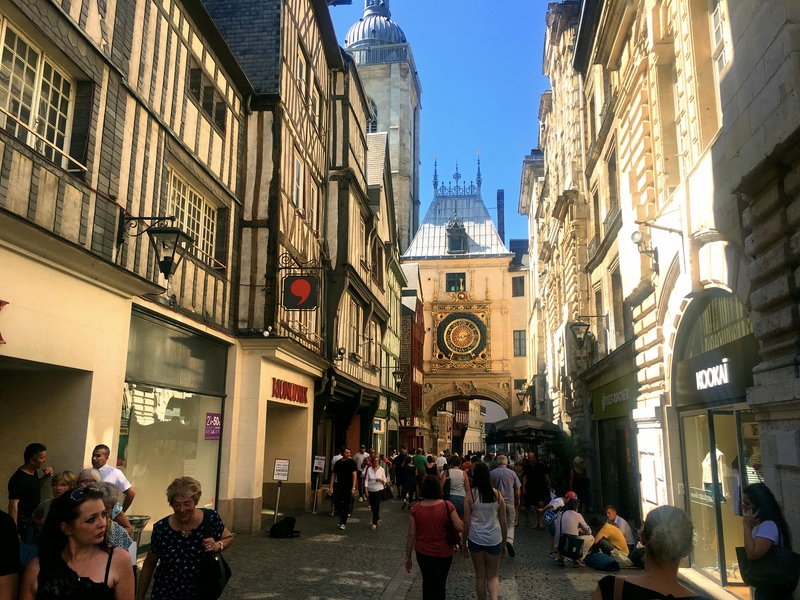 Rue du Gros Horologe (Great Clock Street) was the main street in Medieval Rouen. The one-handed Great Clock itself dates from the 14th century and shows the time, day of the week, and phase of the moon. Not bad for a mechanism that old. 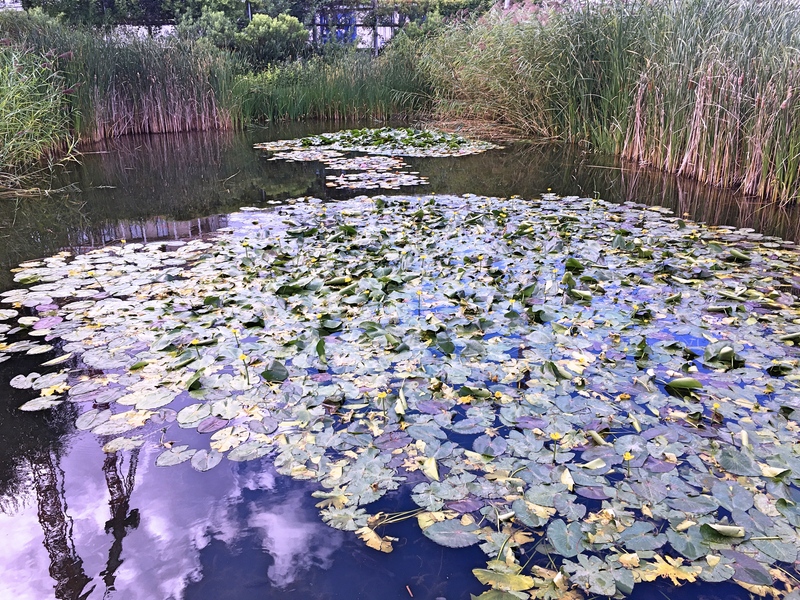 While technically we’d been to Normandy before – Mark was in Mont St. Michel decades ago, and Monet’s house in Giverny is in Normandy – neither of us had ever been to the D-Day beaches and all that Battle of Normandy stuff. 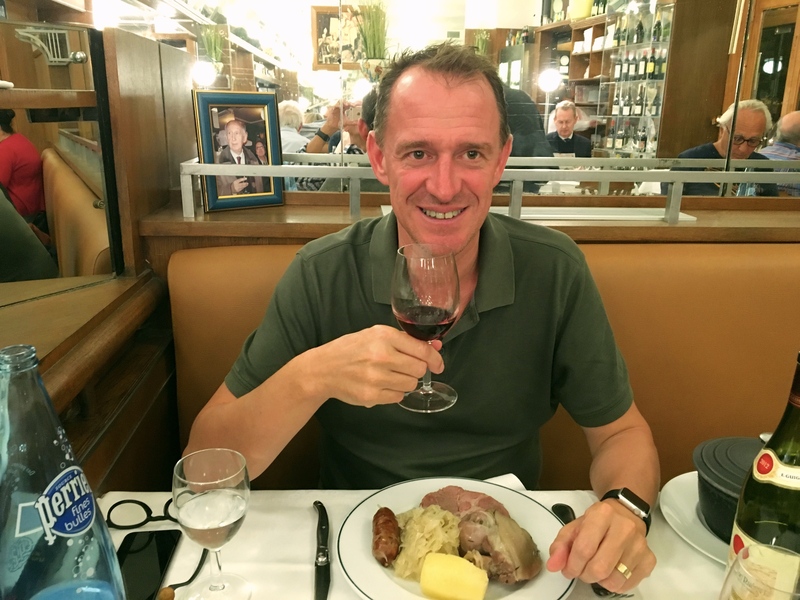 So, once we’d cancelled our trip to Ireland to stay in France, it made sense to go an experience that part of history. 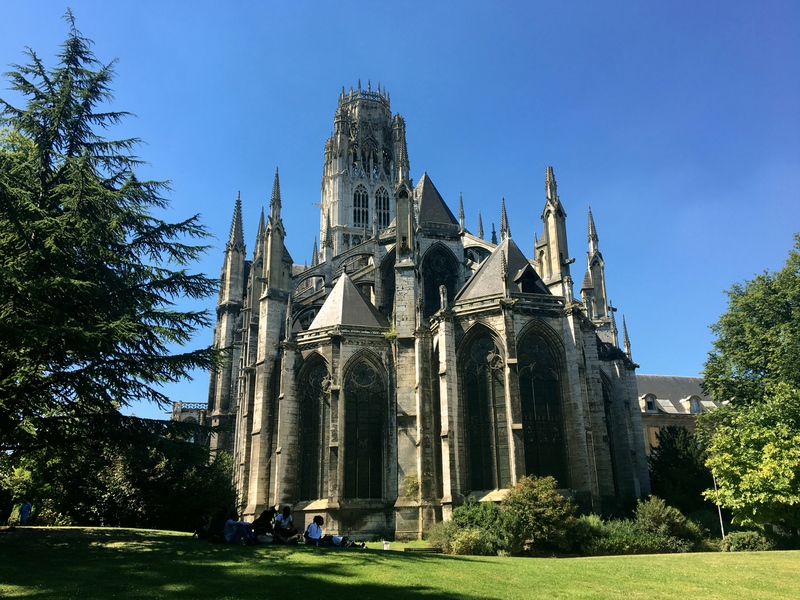 We based ourselves in Caen, a classic Norman city just nine miles inland from the English Channel. While we went there because of its relatively central location for the D-Day invasion, Caen (pronounced something like kaan) actually has two claims to historic fame: besides its central position in the Battle of Normandy, Caen was also where William the Conqueror built a key castle for the defense of Normandy in 1060, just a few years before he conquered England. 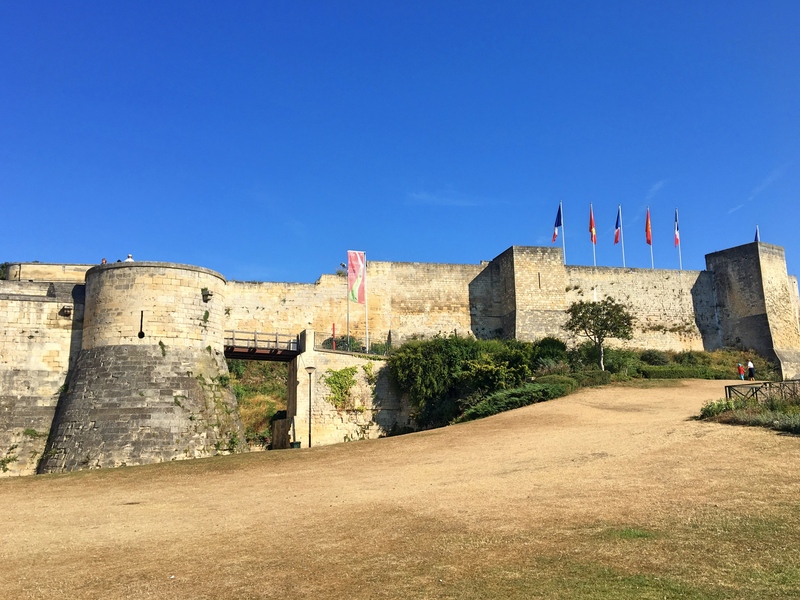 The castle still stands as one of the largest medieval fortresses in Western Europe, and William himself is buried in Caen’s beautiful Church of St. Stephen. 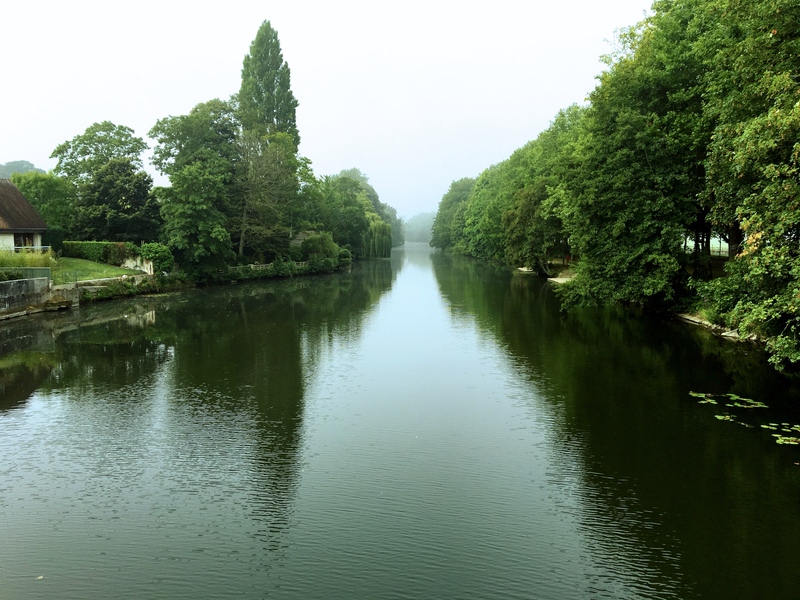 Our stop in Caen was brief – just two days – and most of that was dedicated to the whole Battle of Normandy experience. We did take time, though, to walk through the castle (which was nice but not really that interesting) and through the Church of St. Stephen. We did the latter on the morning of our departure, since we had an hour or so to kill before our train to Rouen. What a fantastic experience! 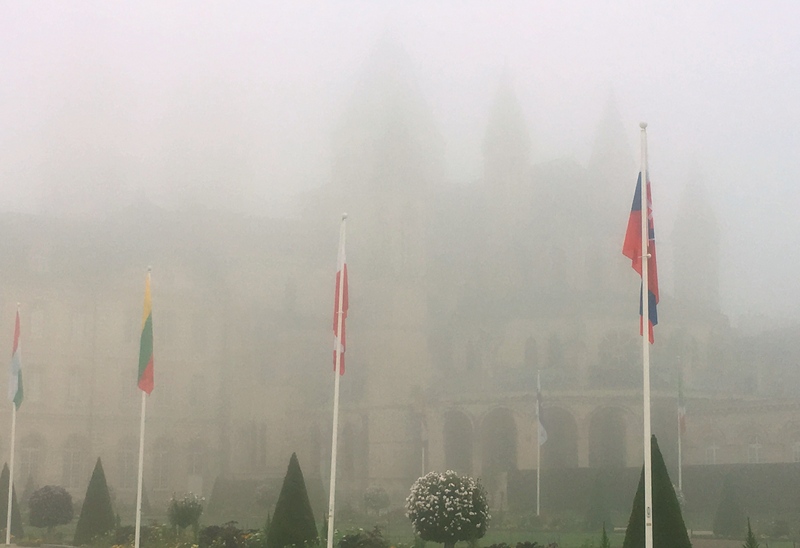 There was pretty heavy early morning fog that gave the thousand-year-old buildings (St. Stephen is adjacent to an old abbey also built by William the Conqueror) a wonderfully eerie feeling. Sometimes you just get lucky. Meanwhile, there were two pieces to exploring the history of D-Day and the Battle of Normandy. First up was the Memorial of Caen (also sometimes called the Memorial for Peace), a museum about World War II with an obvious emphasis on the Battle for Normandy. It was great museum: clear, comprehensive, and honest. I found its message somewhat confused, though that could have been just me. On the one hand it made clear the brutality and fundamental evil of the Nazis, both in their attempt to subdue Europe and of course in the racial war against Jews. At the same time, though, it seemed to try to make the case that war itself is wrong and evil and to be avoided at all costs. One might think that the pictures of Neville Chamberlain in Munich would have put that idea to rest. 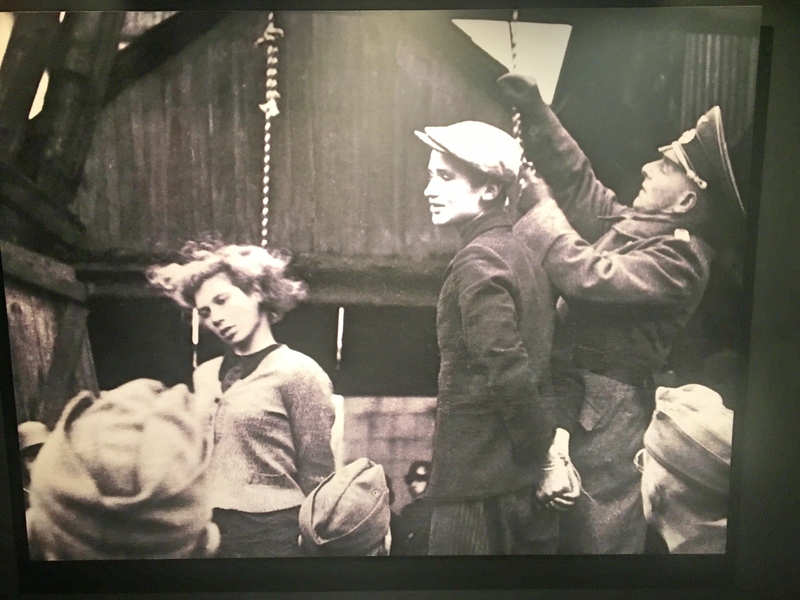 This striking photo of Germans hanging young Soviet resisters was a powerful piece of propaganda for the Soviets, showing how evil the Germans were and how brave the resisters were. What they didn’t reveal until 1996 was that the woman killed here was Jewish. I mean, how could you make a Jew an heroic figure? At the same time I was curious how the museum would deal with the French collaborators, Marshal Pétain and so on who had made a pact with the devil to rule unoccupied France. 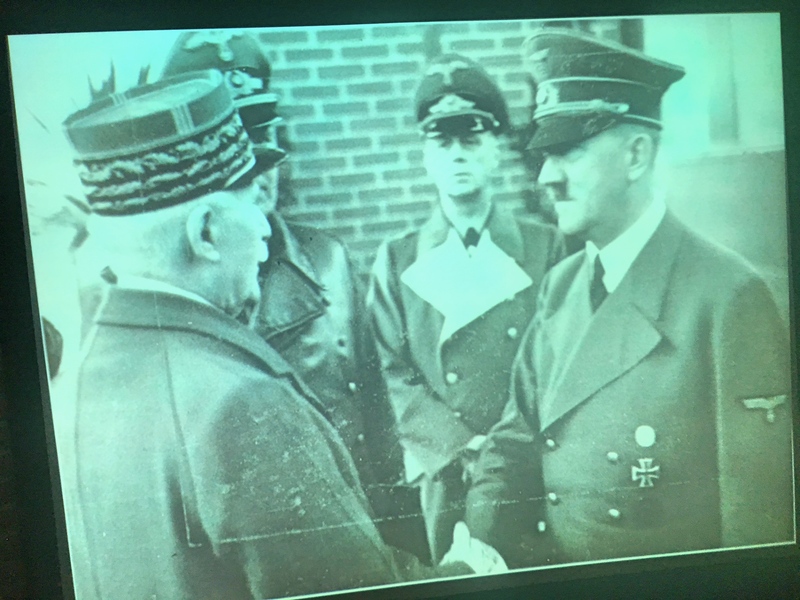 The museum didn’t shy away at all from acknowledging the role those French played in supporting Hitler, observing that Pétain explicitly believed collaboration was important so France would have a seat at the table once a victorious Hitler ruled Europe. 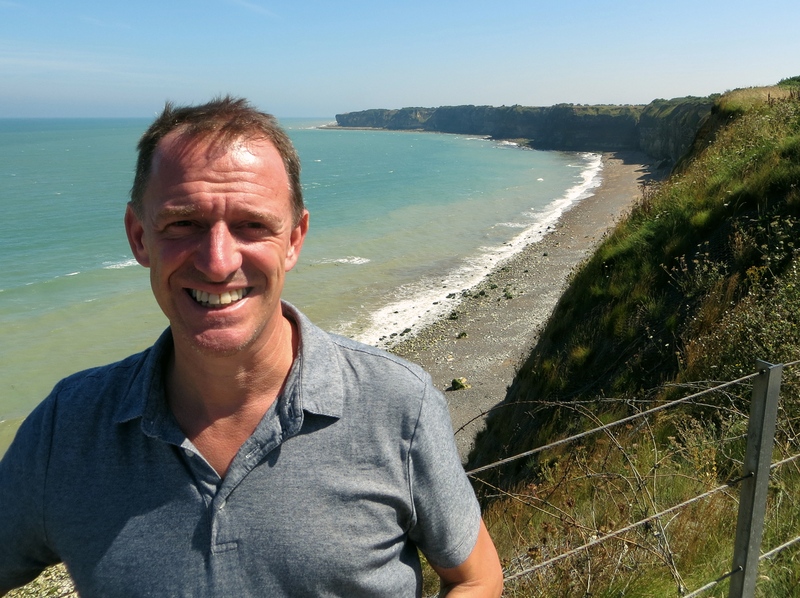 The big event, of course, was a tour of the Normandy beaches. Since we don’t have a car (YAY!) 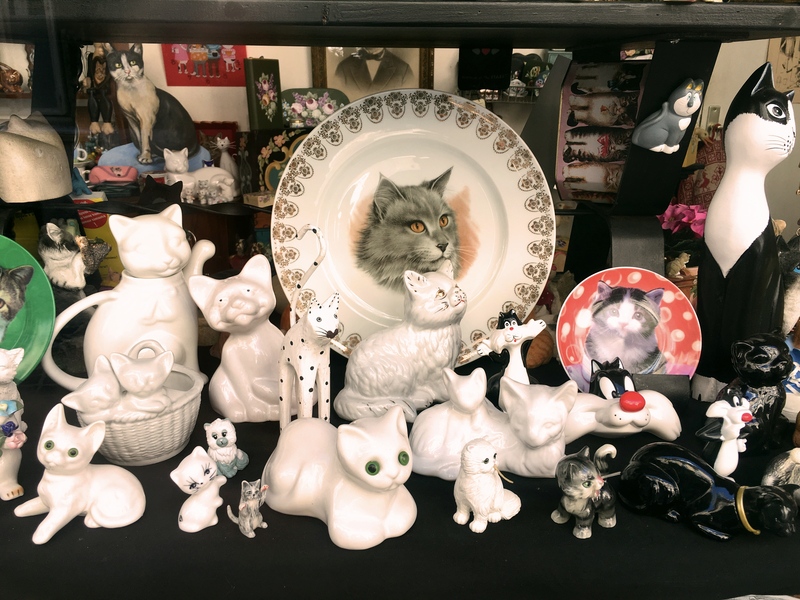 we booked a tour through the museum and, though we don’t usually like being part of a horde, it turned out pretty good. In the English-speaking group along with us there was only an extended family of nine (a spry 80-year-old woman, her kids and grandkids) and one quiet Spaniard so it wasn’t too big a group. Everyone knows the basics here. 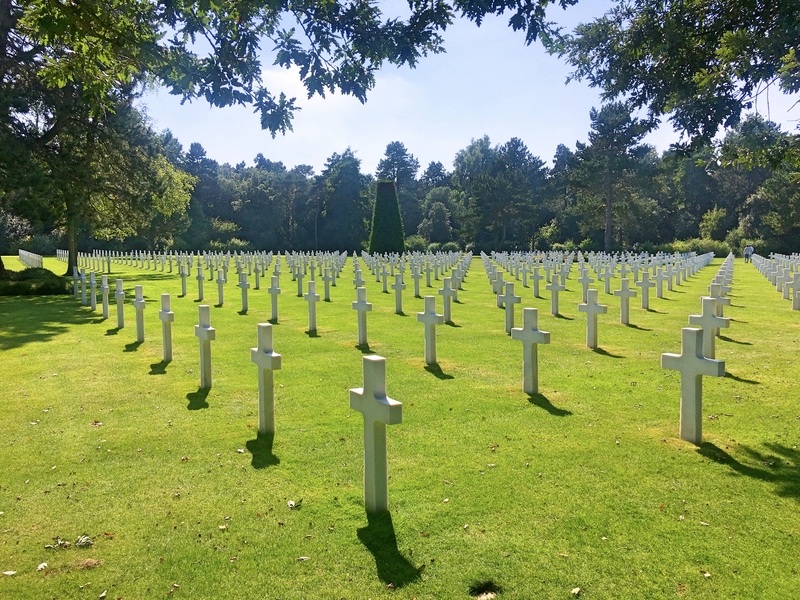 On June 6, 1944 the Allies launched the largest seaborne invasion in history as ultimately a million Allied troops would be committed to the Battle of Normandy. To say the least, it was a big deal. 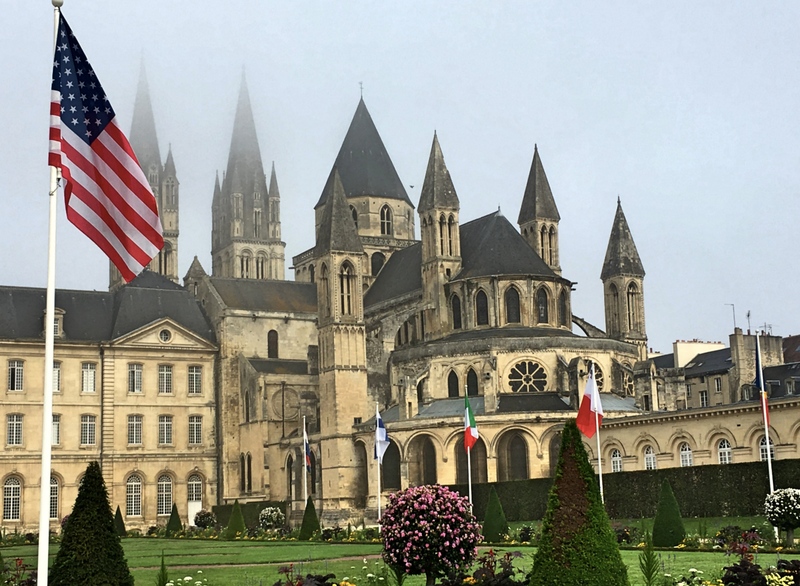 I was glad, though, that both the museum and the beach tour emphasized not just the landing itself and those first days of fighting, but the entire Battle of Normandy, something that I knew little of. 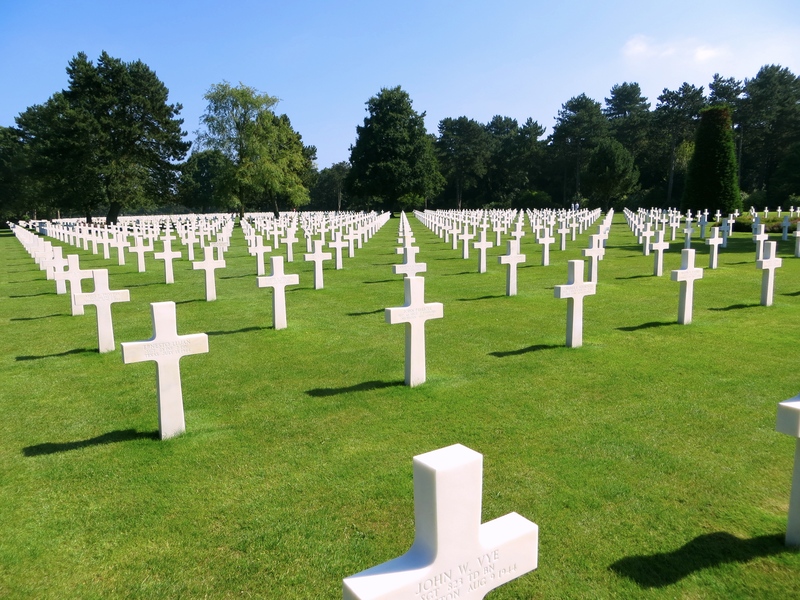 That it wasn’t just the heroism and bravery of those who landed initially, but the brutal fighting that went on for weeks to take towns like Caen and St. Lo, along with the massive destruction wrought as the Germans held out and the Allies pushed forward slowly. Being there, obviously, makes it more alive than it ever is in a history book. And then, on top of all that, to discover that Omaha Beach is really a beach … a huge beach, quite deep and stretching for miles. When you go there today there are lots of families out enjoying the sun and the sand. As though it were just any beach which, to the locals I suppose, it is. 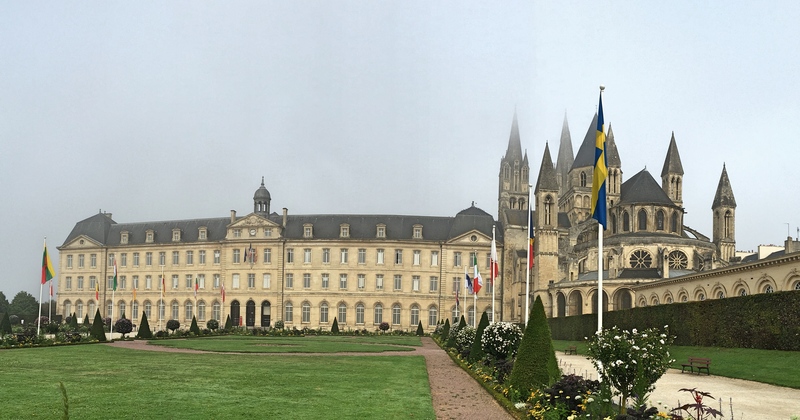 The two-day stop in Caen was not enough. It was a cute town with some great history that would have been fun to explore. 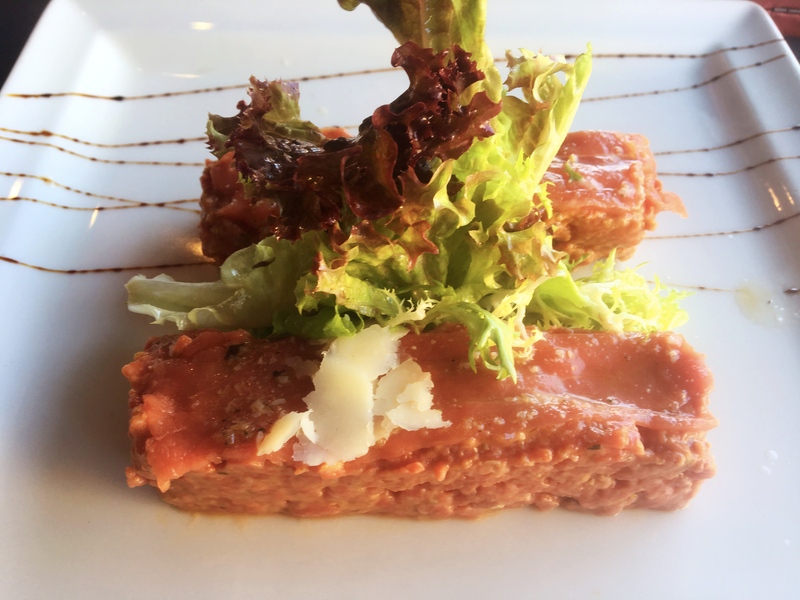 And we just stumbled onto a great restaurant with some of the best steak tartare and escargot we’ve had here in France. The weather is perfect, and traveling by train around here just adds to the joy. The only downside was a hotel malfunction. We booked an Ibis Style hotel, cheap but the number one rated hotel in Caen on TripAdvisor. We got to the hotel and they didn’t have a reservation. We showed them the email and they explained that we’d reserved the other Ibis Style hotel in town, the one rated 31 out of 41 hotels. Ugh. Oh well, it was only two days. And as much as we liked Caen we’d already made hotel reservations in Rouen so now it’s up there for a couple days before heading back to Paris. 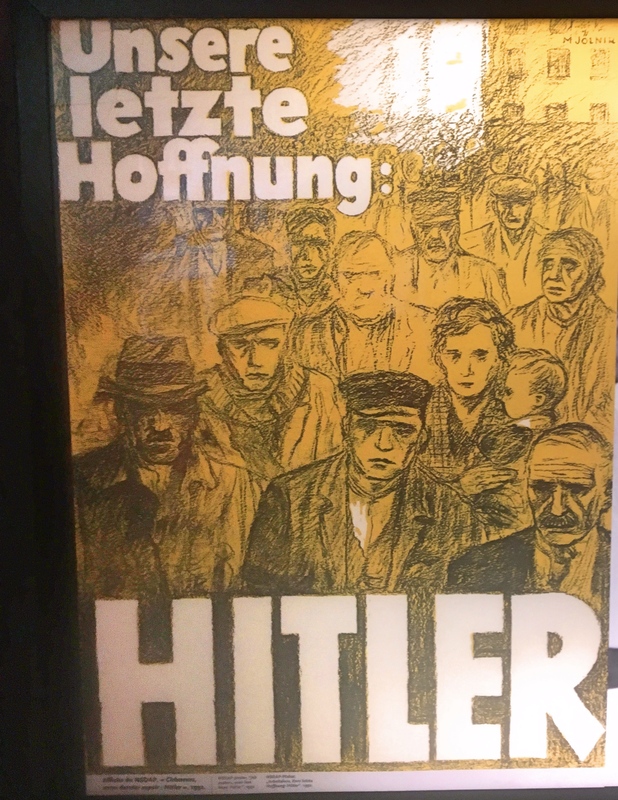 The museum in Caen did not try to whitewash France’s collaboration with Hitler. This photo of Marshal Pétain, the hero of Verdun, meeting with Hitler tells it all. 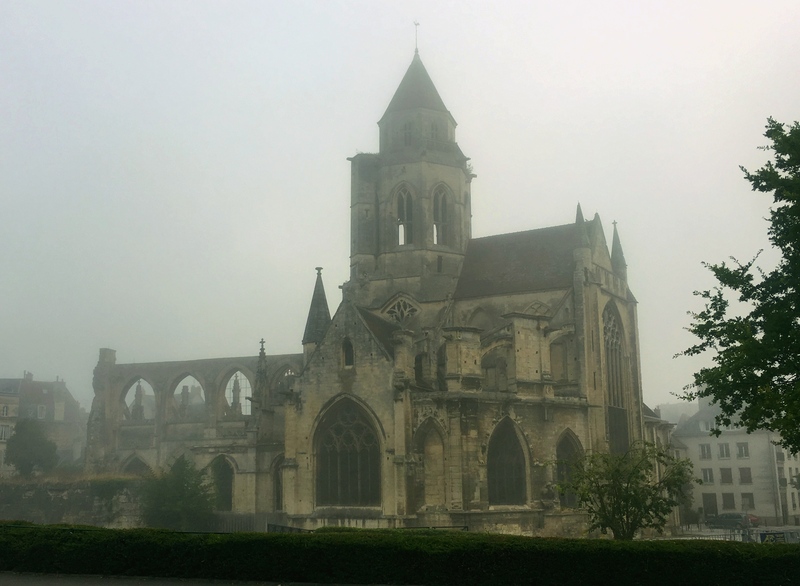 Another church in Caen shrouded in fog. It looks as though the back of the church was bombed out in the Battle of Normandy and was never replaced. As the fog was lifting we got this view of St. Stephan’s. There were flags of many countries in front of City Hall, perhaps in recognition of the role played by the Allies in freeing Caen.